This year has brought about many changes at the Shoreline Police Department. After over 17 years the Westside storefront has closed and been relocated to city hall. This coming year we anticipate closing the Eastside storefront as well and will relocate that operation to city hall. 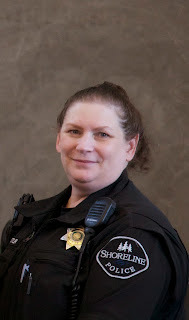 Officer Obstler has been a police officer for 28 years with much of that time spent in Shoreline. For the past 12 years Officer Obstler has been our Westside storefront Officer. Office Obstler has been instrumental in the success of many of our Crime Prevention programs in Shoreline. Officer Obstler at any one time oversaw up to 24 volunteers. These volunteers play a key role in helping several of our programs remain highly successful. Many of Officer Obstler’s volunteers have been with her since she took over and was assigned to the Westside Storefront. No doubt much of that longevity can be attributed to the positive environment that Officer Obstler created. Officer Obstler oversees and provides community training in a total of 16 different programs. She also works collaboratively with city staff to spearhead the “Annual Night out Against Crime” campaign. This year 50+ neighborhoods participated in this event! Additionally, Officer Obstler coordinated our annual Citizen’s Academy and Landlord/Tenant Training. She is also responsible for creating our Retail Theft Program which enables our local participating stores to complete and send in information regarding in-custody shoplifters thus freeing up our patrol officers. Officer Obstler then reviews the case and completes the necessary paperwork for criminal charges. Officer Obstler has also developed and implemented our Memory Impaired Program and was instrumental in our “Give Graffiti the Brush Off” campaign. Officer Obstler’s commitment to her craft and her pride and dedication to the Shoreline Police Department and the residents she serves is to be commended. In 2007 Officer Obstler was selected as the Shoreline Police Officer of the Year. In 2009, she was on the City Web Redesign Team which was selected as Team of the Year. Also since 2007, she provided free car seat checks to over one hundred city residents and others. Officer Obstler returned to swing shift patrol here in Shoreline on October 8th. Our heartfelt appreciation goes to Officer Obstler for a job well done. And what happened to all those volunteers with the move to City Hall? I heard most of them quit. The Long-Range financial planning committee recommended that the city find efficiencies by using more volunteers, instead, they are using far, far less. Officer Obstler also helped plan and organize the King County Sheriff's Citizens Academy in the north end. While a couple people are no longer volunteering others I believe are continuing to do so. I had the honor of meeting Officer Obstler while taking part in the King County Sheriff's Citizen's Academy. At the time, I was a contributing writer for Patch.com, an on-line publication that covered Shoreline and Lake Forest Park news. I met a man (John C. Monroe) and his wife (Eleanor aka "Grammie"). John volunteered for 17 years for the Shoreline Police Department and worked very closely with Officer Obstler. Later, I traded in my journalism cap for nursing school. John spent the last chapter of his life at Richmond Beach Rehabilitation Center. He allowed me to call him Grandpa John. I spent many hours with Grandpa. He told me a variety of stories about Officer Obstler's "attention to detail" and "going beyond and above the expectations of her job title." Grandpa John spoke about the large sum of hours Officer Obstler spent with him and his wife during the times the elderly couple were fighting illness. "Leona drove us to the doctor's office on her days off. She made me a blanket." Grandpa shared Officer Obstler's dedication to many citizens in Shoreline, especially the elderly. "There was a lady who was plagued by rats in her garden. On her own time, Leona helped this lady remove bushes and other brush that the varmints lived in. I think the lady was very happy for the help." There were a medley of stories about compassion for seniors, children and lost animals. The storefront volunteers weren't simply "workers" in Obstler's eyes. They were like family to Officer Obstler. I tell this story because I believe every day; there are so many untold acts of kindness and bravery by our men and women in uniform. Further, my late mother told me, “Once someone has gone to heaven, you can pass on their legacy to the next generation and honor them by re-telling their stories.” Myself? I witnessed firsthand the dedication and hard work Officer Obstler put into her job. I was given an opportunity to attend a "Scam Jam" conference with volunteers of the Shoreline Police Department and a few other events. Recently, I was honored to be invited to a special lunch to honor Officer Obstler's work. This luncheon was attended by over 20 volunteers of the Shoreline Police Department. These volunteers (to this day) remain on their "job." To close, my late father said, “There is no honor more great than serving people in your community.” My dad was (for most of his life) an Air Force jet fighter pilot and later the executive editor of the very first Vietnamese-English newspaper in the U.S. For years, he used his office in Seattle as a headquarters for the hard copy print newspaper and a place where he helped many immigrants to get resettled into the U.S. He and his staff gave out responsible advice, food, household items, clothing, books for kids and more. I can without a doubt, tell you that if my father was still alive, he would say, "I salute you Officer Obstler." Best of Luck to Officer Obstler! She has been a great asset and caring professional here and if I recall, instrumental is solving crimes and preventing them in the future.